Whether you worship them or think they're overrated, probiotics have become a staple in healthy eating. There are even tons of commercials dedicated to the stuff! The live cultures help promote gut health, which is good for overall digestion, a healthy immune system, and possibly weight loss. All those side effects are wonderful, but they kind of don't happen if you're not getting enough prebiotics. These lesser-known substances are just as important for a healthy gut microbiome, and work hand in hand with probiotics to make sure everything in the digestive system is running smoothly. Even if probiotics get all the attention, prebiotics should be a staple in your diet. Luckily they're pretty easy to come by -- and you don't even need to eat the yogurt that makes you poop to get them. Eating probiotics introduces billions of the good bacteria you need into your gut, while eating prebiotics helps feed that good bacteria to help them flourish. Unlike probiotics, prebiotics aren't alive; rather, they're fiber compounds that aren't digested until they reach your gut microbiome. A healthy gut has more good bacteria than bad, and prebiotics are important to keep the good stuff in proper working order. Basically, prebiotics are the fuel your good bacteria need to stay alive. Aside from the physiological benefits of having a healthy gut (digestion, immune system, bulging biceps? ), gut health can affect brain function, too. And as more research points to the importance of good gut health, it's becoming clearer that the way to optimize it is through probiotics and prebiotics. But prebiotic consumption goes beyond just gut and brain health; it's been linked to other overall benefits, including reducing the risk of colorectal cancer, and improvement in bone density. Since probiotics are a plant-based fiber, eating a diet heavy in fruits and vegetables is a good start. They're plentiful in common produce you're probably already eating. The bad news is that they're at their most beneficial when eaten raw. That's fine for things like bananas (delicious! ), but a little rougher for garlic and asparagus. 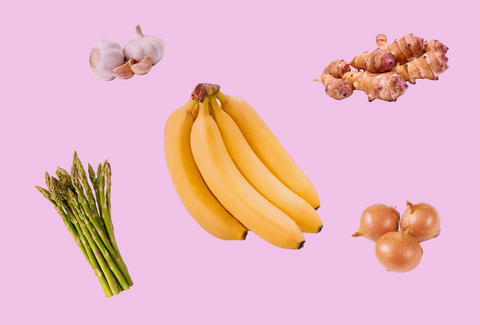 To keep your gut -- and everything else related to it -- thriving, prebiotics are essential. And you don't even need to take any special supplements to get your fill. Christina Stiehl is a Health and fitness staff writer for Thrillist. Raw asparagus doesn't sound all that bad, actually. Follow her on Twitter @ChristinaStiehl.